It is officially crunch time for women’s basketball. With two conference matches left before the postseason begins, the Cardinals will need to pull out all the stops in order to make it to the NESCAC playoffs. Wesleyan is currently tied with Hamilton for ninth in the NESCAC. Both teams have a conference record of 2-6. The top eight teams make it to the postseason, so a number of very crucial events must take place in order for the Cardinals to enter the tournament. First, Wesleyan must win its final two regular season games against Bowdoin and Colby. Without these wins, the Cardinals will surely be out of the running for the tournament. Secondly, Conn College must also fall to Colby and Bowdoin, and Trinity has to lose to Middlebury and Williams in order for the Cardinals to secure their coveted spot. Finally, Hamilton can only win one of its two upcoming games against Tufts and Bates. If all of these occur, Wesleyan will be able to garner a seven or eight seed in the NESCAC tournament. At this crucial point in the season, the Cardinals will need to rely on the players who have shone this season. Dreisen Heath ’15 has had quite a strong series of play for the Cardinals. After being named tournament MVP at the Blue Jay Classic in the early season, Heath has been consistently strong. Throughout the last few months, she has proved to be the go-to guard for the Cardinals, leading the team in well-played games against both Amherst and Conn College. Sophomore Cherkira Lashley has also proven to be a valuable asset to the Cardinals. Switching between guard and small forward, Lashley’s versatility on the court makes her indispensable for Wesleyan. Her killer rebounding skills, as seen especially in the team’s games against Amherst and Trinity, will be crucial to ensuring a Cardinal victory in the final games. 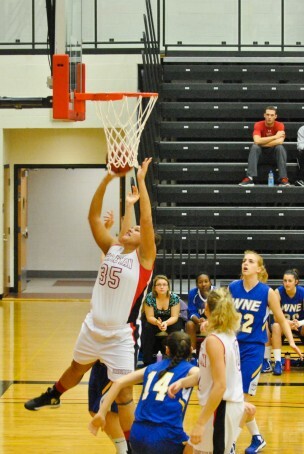 Kendra Harris ’13, whose strong presence in the post has helped carry the Cardinals all year. She is the lone senior on the squad, and her experience and leadership have been essential for the young squad. Another one of Wesleyan’s top point getters has been Jess Cherenza ’15. She has performed well under pressure, as seen in early games against Colby-Sawyer and Worcester State. The team’s greatest strength as a whole lies in its cohesiveness. Although the team is endowed with individually strong players, the Cardinals have no one star, an aspect of their team dynamic that will be crucial in the upcoming games. In order to see a Cardinal victory, the Wesleyan ladies will need to channel the team spirit that they had in their best games of the season against Amherst and Conn College. In summing up what the team needs to make it to the post-season, Lashley perhaps puts it best.